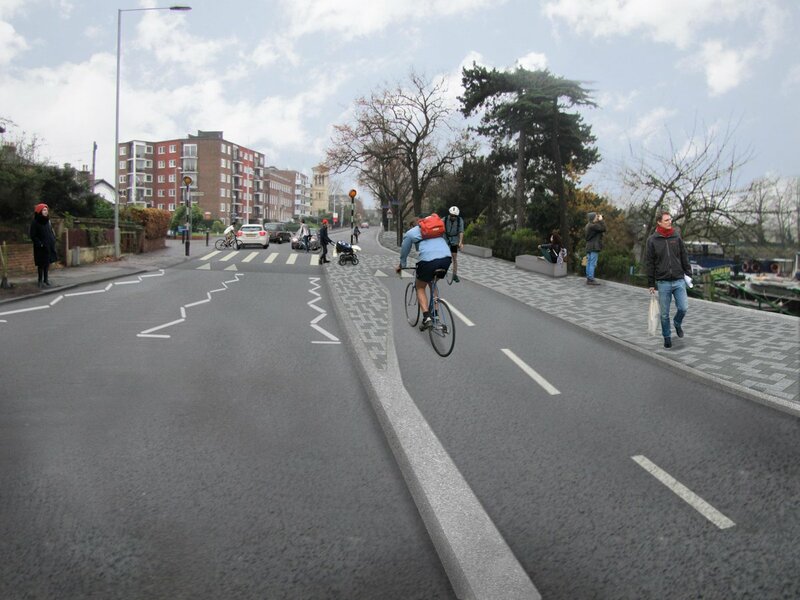 Kingston Council have produced revised proposals for the Portsmouth Road mini-Holland scheme which Kingston Cycling Campaign say are a "considerable improvement" on previous plans. LCC and others expressed concerns with the initial plans, which would not have provided the safe and inviting space for cycling which is badly needed on this busy main road. Councillor Richard Hudson, Chair of Infrastructure, Projects and Contracts Committee, and Lead Member for the Council’s mini-Holland Programme, said: “Over 700 people took part in the consultation on our first set of plans and we thank all of those who took the time to consider our original proposals and get involved. I believe that this second proposal shows we’ve listened. There was a clear desire for more segregation between cyclists and motor vehicles and the new plans have increased this segregation from 20 per cent originally, to 85 per cent now." Kingston Cycling Campaign say they will be seeking further assurances about the design but thank RBK Councillors and Officers involved in the Mini Holland Project who listened to, and took account of, the views expressed in the consultation. The revised proposals include a two way cycle track on the river side of Portsmouth Road on the northern part of the route with protected space and floating bus stops, which represents a reversion to the original design in the bid document. The southern section of the route is light segregation by plastic ‘armadillos’, which Kingston Cycling Campaign say they are concerned to ensure they will be robust enough for use on Portsmouth Road and whether they represent a sufficient measure of segregation: a greater measure of protected space may be needed. The revised proposals are available on the Royal Borough of Kingston website. A presentation board showing the plans will be on display in the reception area of Guildhall 2, High Street, Kingston upon Thames KT1 1EU from Monday 23 March until Friday 10 April during office hours. The consultation report has also been published. Thanks to Kingston Cycling Campaign and to all who responded to the consultation.